The latissimus dorsi, otherwise known as your “lats”, is the widest muscle in the human body. Having a strong latissimus dorsi is very important for improving posture, preventing back pain, and improving spinal stability. Have you ever heard someone say “you need a strong backbone” in life? Well, your lats are the muscles that support your backbone. Building a strong latissimus dorsi muscle is vital to protecting your spine and also keeping good posture. When we refer to the “origin” and “insertion” of a muscle, we’re talking about which end of the muscle is fixed to the skeleton, and which end moves when the muscle contracts. This resource explains this in a bit more detail. Most skeletal muscle is attached to bone on its ends by the tendons. As the muscles contract, they pull on the bones, which causes movement. In most cases, one end of the muscle is fixed in its position, while the other end moves during contraction. The origin is the attachment site that doesn’t move during contraction, while the insertion is the attachment site that does move when the muscle contracts. The latissimus dorsi has its origin in four places. These are the iliac crest, lumbar fascia, spinous processes of the 7th to 12th thoracic vertebrae, the last four ribs, and the inferior angle of the scapula. The “lats” insert into the intertubercular groove of the humerus, which is located on the front of the humerus. One function of the latissimus dorsi is the medial rotation of the humerus. This means to rotate the arm inward toward the body. Another function is the extension of the arm. Think about how you bowl a bowling ball. In the first movement of the bowl, as you swing your arm back, you internally rotate your arm with your lats. As you come through with the next movement of your bowl, you are extending the arm forward with your lats once again. One more function of the latissimus dorsi is the adduction of the arm. This means to bring your arm toward your body. You use your latissimus dorsi heavily in sports such as swimming. All swimmers need to have an extremely strong latissimus dorsi muscle to help propel them forward in the water. To visualize this, think about the freestyle stroke of swimming. You are lying face down in the water while pulling each arm down and back alternatively to propel your body forward through the water. 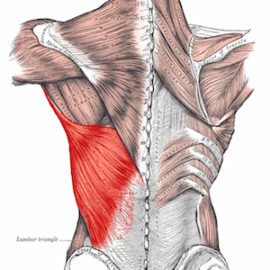 We use the latissimus dorsi constantly throughout our daily lives because of the strength and large size of the muscle. Building a strong back through strength training is key. Engaging the lats will only happen when you exercise with correct form—otherwise, your other muscles will be engaged to share the load, and none of them will get an effective workout. Take the Hammer Strength Pulldown exercise, for example. By focusing on locking your shoulders down and keeping your chest and chin up, this will allow you to first depress your shoulders down and then pull your elbows and hands to the floor. This correct and detailed form will ensure that we are only focusing on pulling with the latissimus dorsi, and not recruiting other muscles to help us perform the exercise. Loved the details, I learned a lot about the Latissimus Dorsi mechanism. Great stuffs!